Woodland Lakes is committed to creating a safe and nurturing environment where campers can grow spiritually, socially, emotionally, and physically while enjoying God’s creation. Campers are provided the opportunity to better understand themselves, their relationship to God, and the people in their lives so they can apply their faith in every day life. 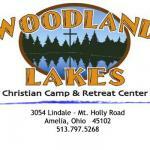 Campers of all ages, ethnicity, gifts, and challenges will find their time here enriching and encouraging. We invite you to join us for a summer that is sure to change lives and change them forever.